It was a historic day Saturday, November 7th at Detweiller Park for the Hornets! Our 4th place finish was the highest finish in the program's rich history! In addition, Charlie Nodus ran a school record 3-mile time of 14:29.8, good for 2nd place in the entire race behind only Jack Aho of Grayslake Central, breaking venerable All-American Eddie Slowikowski's 31-year old school record, and Roman Drabchuk was close behind in 3rd, tying Eddie's old record of 14:34. Roman ran 14:34.1, and there was no decimal point listed for the old record, so we'll call it a tie. Needless to say, it was an amazing performance by those 2. A team can't place 4th without a good supporting cast, and the other 5 runners gave 100% and moved from 8th place at the mile to 7th at the halfway point, and 5th at the 2 mile. Every single member of the team ran as instructed, getting out aggressively (every single member ran their fastest ever 1st mile) and moving through the crowd through the race. Special mention to Brett Haffner (#21All-Time Hinsdale South Detweiller time) for an amazing 52nd place as a sophomore, and 5th man Brian Jordan for gaining 15 places in the last mile to secure 4th place. And though I know our 3-7 runners all were hoping to run a little better, the fact is we all did well enough to place 4th, which seems to be as well as we could have done, team wise, given the great 3 teams in front of us. That is a lot more than many teams can say about their pressure-filled State meet performance. I am proud of everyone. - Best ever team finish 4th Place!!!!!!!! We ALL contributed to this! - Charlie Nodus and Roman Drabchuk top two 3 mile times in team history!!! - Good performances in unofficial open race on Friday! - Team moved from 8th at the mile to 7th at 1.5, 5th at 2 miles, to 4th at the finish! For the 1st time in 30 years, we're off to State in back-to-back seasons! We placed 2nd at the Wheaton Academy Sectional on Saturday, behind only Yorkville High School, winner of the last 2 State Championships. Although we had a few rough races in the muddy, cold, windy, rainy conditions, we were good enough to easily punch our ticket to Peoria. Charlie Nodus continued to garner more awards as he added a Sectional title to the 2 Conference titles, Regional title, an All-State designation he has already earned in cross country, while Roman Drabchuk (3rd) and Brett Haffner (7th) also medaled. Chris Joseph, Brian Jordan, Tristan Ramirez, and Trevor Schauer also competed and will make up the State lineup. Trevor Lehmann, Tim Rudolph, Cesar Lopez, Sean Cusick, Matt Harte, and Christian Schauer will also travel with the team, which will compete at high noon at Detweiller Park in Peoria. - We’re going to State!!! - Some good performances under very challenging conditions; some “off” days but we have another weekend to run a better race! - Congrats to Charlie Nodus on his first Sectional Championship to go along with 2 Conference Championships and 1 Regional Championship! Yesterday we ran great at Regionals and took home our 2nd consecutive IHSA Regional Championship! Roman Drabchuk and Charlie Nodus were 1st and 2nd place under strong winds, and Brett Haffner (5th), Chris Joseph (10th), Trevor Schauer (18th), Tim Rudolph (37th), and Trevor Lehmann (38th) rounded out the crew. Despite it being one of the deeper regionals in 2A, and many in 3A, for that matter, we easily beat 2nd place #19 Wheaton Academy 35-74. And that was without Brian Jordan and Tristan Ramirez! 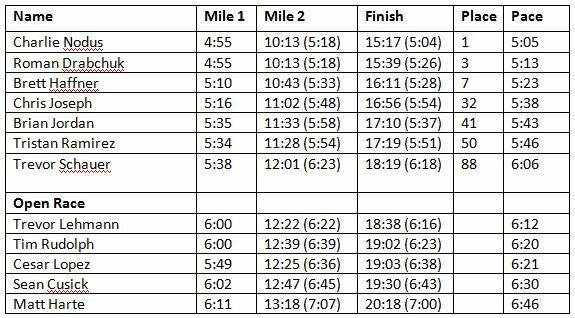 I also want to point out that, with our 2 freshmen in the lineup, we return 5 runners next year from this meet, and we had the top runner for every place (1st man through 7th man)! - Congrats to the Regional Champions 2nd year in a row! - Congrats to individual champ Roman Drabchuk and medalists Charlie Nodus and Brett Haffner! - Excellent poise by freshmen Tim Rudolph and Trevor Lehmann; we were the only team with 4 fresh/soph runners! We had a fantastic team performance Saturday in Downers Grove at Conference. Although we obviously wanted a Conference Championship, there was no shame in getting 2nd 31-34 to a State ranked Downers South team. Their coach has told me this is easily the best team he has coached in his 10 years here. I would say our team would have won conference easily every year since I've been here with the performance we had. That's why team place goals are great, but, ultimately the only thing you have control over is your own effort. And we had some amazing performances up and down the lineup. It is easy to focus on the great performances by Charlie Nodus, who defended his Conference championship and broke his own course record with a stunning 14:45, Roman Drabchuk, who ran every step with Charlie for a virtual tie, missing those accolades by a supposed 3/10ths of a second (about the time it took for the timer to click the watch), Brett Haffner, and Brian Jordan. However, we had great performances in all races, not just varsity. Special mention goes to 1st year cross country runners Jordan Arzate, Tim Grady, John Whalen, and Ezra Saywitz, who all improved by a minute or more over their previous pr's! The freshman and sophomore races also featured All-Conference performances by Trevor Lehmann, Tim Rudolph, Tanner Booth, and Christian Schulte, a big PR by Tony Ma, and Pat O'Malley's first race after joining the team last about 10 days ago!! And the jv race was great top to bottom. Sean Cusick, Matt Harte, Cesar Lopez, and Porleark Tuy all got under 18 minutes for the first time this year (1st time ever for Sean and Matt), and placed in the top 15, securing All-Conference recognition! They were followed by Jared Needham with a big PR, Adrian Mo with a solid race, Alex Beronio with perhaps his best race of the season, Nathan Arnold with a PR, James Most finally breaking his PR from sophomore year, junior Charles Thuruthiyil with his 1st race of the year after rehabbing from injury, Sam Chang with a pr, Wesley Warton with a big PR, and Malav Shah with his best race of the season. It was a pretty perfect way to end the meet. All told, it was a great day. - 18 PR’s and 4 Season Bests out of 31 total runners! - Amazing 13 All-Conference (top 16) runners among 4 races! - Charlie Nodus new course record; Roman under previous record time! - Especially proud of the seniors in JV running great final races! Charlie Nodus' 14:57 set the O'Brien Park course record, according to their coach, by over 20 seconds. Nobody from another team has broken 16 minutes on the course this year and every team in the conference has run on it. Other huge pr's were set by Trevor Schauer, Tim Rudolph, Christian Schulte, Nathan Arnold, Sam Chang, Tim Grady, John Whalen, and Daniel Frank, with huge seasonal bests by James Most and Tre Von Geary. Also, we went 1-2 in the sophomore race (Brett Haffner and Trevor Schauer) and freshman race (Tim Rudolph and Trevor Lehmann). Brett finished the conference season undefeated at the sophomore level. Our varsity team not only finished undefeated, but, when including Brett and Trevor, no team even put a runner in front of our 5th runner at any meet! Anyway, it was a great way to tap the "regular season"--now we are off to the championship phase of the season. For those not in the top 7, this means we will have 2 relatively easy weeks of training and will be getting done earlier, usually by 4:45 or so every day. - All-time course record for Charlie Nodus!!! - 13 Personal bests and 2 season bests—amazing effort on Monday afternoon! Good afternoon! This was a pretty good performance after a hard week of practice and on a slow course. I feel guilty not having been with the team for several days, but my "real job" dictated that I attend the college counselors' conference every two years. Having said that, anyone who wants to know about universities in Southern California, I've visited 10 of them in the last week! As for the meet, I feel like this course tends to run 20-30 seconds slower than Detweiller Park. Given that conversion, great races were had by Brett Haffner, Cesar Lopez, Matt Harte, Porleark Tuy (season best), Dylan Fichtelberg (personal best), Jared Needham, Nathan Arnold (pr), Ezra Saywitz (big pr), Jordan Arzate (big pr), and John Whalen. Also, in the small school division, we placed 2nd in the freshmen division and 3rd in the varsity division without our top 2 runners. Top 20 finishes were had by Brett Haffner, Chris Joseph, Christian Schulte, and Tanner Booth, with a spectacular 1-2 finish by Trevor Lehmann and Tim Rudolph in the freshman race! I will send individual results with splits within the next couple days. Full results can be found at www.runnersedgeracetiming.com. Go to results and the Pat Savage Invitational. I look forward to being with the team tomorrow as we take on our final 2 conference opponents, Willowbrook and Downers Grove South. I believe by the end of the the day we will have made it through our conference season undefeated! Our last Saturday practice will be at 8 at Waterfall Glen, and then we are on to the championship phase of the season! The meet will be at about 5 pm at O'Brien Park in Downers Grove. - Times were extremely slow on that course and Morton didn’t run their top 5, so hard to quantify exactly how we ran, but I thought we looked great, with excellent team running & great effort! - Great races by Brian Jordan, Trevor Schauer, Tim Rudolph, Sean Cusick, Dylan Fichtelberg, Tony Ma, and Daniel Frank. Athlete of the meet=Sam Chang!! · First varsity win over Morton in at least 6 years! -Our average time for our 1-5 varsity runners was 15:30. This is 4 seconds faster per man than we were at State last year, and, upon further investigation, our fastest team average in 29 years, since the 1986 State meet! -The teams that beat us were all ranked by Dyestat: Sandburg (1 3A), Neuqua Valley (3 3A), York (5 3A), Mahomet-Seymour (1 2A), Oak Park (8 3A), St. Charles East (19 3A), Lake Zurich (6 3A), Stevenson (22 3A), and Maine South (7 3A). We beat #18 3A Loyola, Springfield (6 2A), Chatham Glenwood (10 2A), Lincoln Way West (13 2A), Normal University High (15 2A), Peoria Notre Dame (19 2A), Wheaton Academy (20 2A), St-Joseph/Ogden (4 1A), Monticello (6 1A), and Pleasant Prairie (10 1A), along with a number of very good but unranked 3A teams. -In 2013, our varsity finished 54th with 1521 points; last year we were 30th with 867 points. This year we finished 10th with only 393 points. -Roman Drabchuk's 14:41 is the 2nd fastest time at Detweiller Park in team history, behind only Eddie Slowikowski's 14:34 in 1984. Charlie Nodus (14:51, 4th), Brett Haffner (15:46, 28th), Chris Joseph (15:50, 30th), and Brian Jordan (16:20, 42nd) are all among the top 50 runners. -Of 30 runners who competed yesterday, 21 ran all-time personal bests, while 6 more ran season bests. - Amazing 21 p.r.’s and 6 Season Bests among 30 runners! On Wednesday, September 9th we had another successful meet! Sadly, it was already "senior day" at our course, and I was proud of how everyone competed. It was truly amazing to see everyone in that box at the starting line. Obviously this senior class is an absolutely huge reason we are successful, but what I love about it is how good of young men they all are. Plus, I don't think I will ever have a class that big again on the cross country team. There are 24 seniors on this team, or more than 1 in every 9 males in the class. That is astounding, and I'm glad that could all enjoy cross country, a sport I obviously love. And although we were dominant in the meet overall, the fact that Leyden beat us on the freshman and sophomore level, and our "non-senior" box was much smaller reminds us that we need to still keep striving to get better and think of ourselves as underdogs. I have attached meet results. Some highlights: Roman Drabchuk (15:08 #3 course time in team history), Charlie Nodus (15:13, #4), Trevor Schauer (16:59, #79), Dylan Fichtelberg (19:34), and Jared Needham (19:53) ran all-time personal course bests, despite running there several times under much cooler conditions last year. Also, many Hornets ran their 1st ever 3 mile race and now have a time to compare against the rest of the year. - Some great 1st 3 mile races—now we have a starting point from which to improve! We had a fun Saturday at Reavis High School yesterday! Luckily the rain stopped in time for the races. I know we would have still run well in the rain, but I think we can all agree it was better to watch in the beautiful fall weather. I do think the course was pretty slow compared to Katherine Legge despite the cooler weather, so take the times for what that's worth. I can't wait until Saturday to see us on the fast State-Meet course at Detweiller Park in Peoria! I will send an e-mail later in the week with times, lineups, and directions. Until then, please read the comments at the bottom of the results sheet, as there was a lot to celebrate yesterday for us. - Brett Haffner f/s race champ with only 1 shoe! Congrats!! - F/S team finished between Sandburg and LT; currently ranked 1&2 in State varsity! First of all, thank you so, so, so much for all your help, parents! I truly appreciate all the people willing to help make this a smooth meet (and the pasta party, too!). The other coaches I talk with all rave that this is one of the most fun, well-run meets in their season, if not THE most, and it is because we have so many people willing to help. As the saying goes, many hands make light work! This meet is a huge undertaking at the beginning of the season, but it is a great test for the boys that they (mostly) passed, despite being relatively under-coached because of all the running around Coach Stimpson and I have to do due to our meet duties. In short, we showed huge improvement as a team and by many individuals. We are truly one of the better teams in the state, and we had great effort and improvement throughout the lineup in all 3 races. There is always room for improvement, and a couple key varsity runners, in particular, looked tired after a tough week of 3 meets and extreme heat. It is my job to adjust and make sure everyone is ready to be at their best by the end of the season, and I know we will still see huge improvements. Results can be found at www.raceresultsplus.com. - Roman Drabchuk (#3), Charlie Nodus (4), Brett Haffner (26), Brian Jordan (46), and Chris Joseph (54) all make All-Time team KLM performance list! - Welcome back, Alex Beronio! -Look at improvement for Brian Jordan, Matt Harte, Christian Schulte, and others! We also won the Plainfield North Invitational on Tuesday. We beat 3 teams ranked in the pre-season Class 3A top 30 this week, even though we are in Class 2A.